Today I’m going to teach you how to make brown rice in your Instant Pot! Perfect Instant Pot Brown Rice. Every. Single. Time. If you’re among the people who have not taken the Instant Pot plunge, you’re not alone. I thought I was the only person in the civilized world who did not own an Instant Pot a few months back, and later found I was not alone! Every time I talk about the Instant Pot on my Intagram account people ask questions about the pot, or tell me they have it in the closet and still have not used it! If you’re thinking about buying an instant Pot, I’m here to tell you they are worth the investment. If you are wondering do I need one large (8-10 qt) , or two smaller pots? I think this size is perfect for families of 4-8 and I would rather buy two 6 quart pots instead of one larger pot. There are many times I wish I had another pot for purposes of cooking two different dishes at the same time. 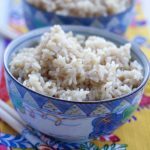 The Instant Pot turns out a perfect pot of brown rice! I was a little hesitant to use the Instant Pot for brown rice because I haven’t had great luck using other cooking methods and pressure cooking and rice did’t seem a likely candidate for a good pot of rice! Traditionally rice cookers steam the rice over a period of time, and during the steaming process much of the water added to the rice cooker escapes while cooking. In the Instant Pot, very little of the water escapes and instead stays in the pot. I’m convinced part of the reason cooking brown rice has been so hit and miss for me previously resulted from the variable of how much water escapes during the cooking process. If too much water escaped, the rice was still hard and not cooked enough, if too little escaped, the rice was mushy. I’m sold on the simplicity and dependability of the end result when using the Instant Pot. I like to keep recipes as simple as possible. Perfect Instant Pot Brown Rice is about as short and sweet as it gets! Three ingredients: rice, water and salt combine to make the perfect pot of rice. Just swish the ingredients in the pot, plug it in and in a few minutes perfectly cooked brown rice. No guessing, no sticking your finger in the pot, no watching for boiling and then forgetting to set the timer, no bubbling over the pan. I promise you’ll never need another recipe for cooking a perfect pot of brown rice. Place the rice, water and salt in the Instant Pot. Make sure the rubber seal ( in lid) is in place. Lock the lid, set the steam release valve to the "sealing" position. Use the manual setting and set timer to 25 minutes. After rice has finished cooking and timer goes off, let sit for 10-15 minutes. Manually release the remaining pressure in the pot by using the pressure release valve. Open, fluff rice and serve. -If you have leftover rice, place in a ziplock bag or bags ( I do this according to serving sizes) and freeze. When ready to use, microwave rice for about a minute to use. Hi Si, I have a power cooker Xl. I live in Cedar City. I am having trouble getting things done in it. I was thinking it may be the altitude. Do you have any tips or suggestions? Thanks so much! Maybe I need to invest in an instantpot. Are you having trouble with food not being cooked all the way through? From what I understand, it may take the Power cooker XI a much longer time to reach the desired pressure for cooking. You may want to check your manual for times and pressure. I do all my pressure cooking in a 6 or 8 qt Instant Pot. Good Luck! Literally, the perfect brown rice! No soggy rice or water left in the bottom of the pot. I followed the directions exactly, and I was amazed. The rice was slightly sticky, and had just the right texture. 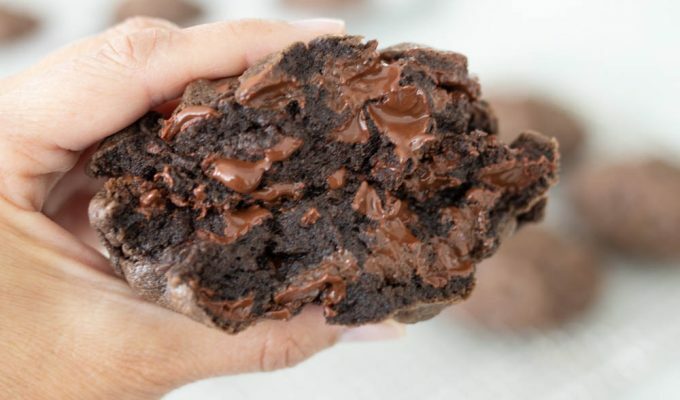 Yeah, like the recipe says… perfect! I know! I love cooking rice in the Instant Pot! So glad you got the same amazing results I did. Does this work with the 5 minute brown rice? I am not sure? I am guessing no. This recipe was not tested using a 5 minute rice. It most likely needs less time than traditional Brown Rice! Hi there. Very new to the instant pot. I have only cooked hard boiled eggs for egg salad (so easy to peel!) I am only cooking for two – can i halve this rice recipe? Thank you so much, looking forward to trying some of your recipes! Yes it can, but I recommend cooking the rice, and saving extra in a plastic container in the fridge. Brown rice can be added to salads, wraps, soups and other dishes. Throw some steamed veggies on top for a quick, healthy lunch. Brown rice can also be frozen flat in a zipper bag and reheated in the microwave. Let me know when you give this recipe a try! I finally made this, and it was perfect – THANK YOU! saved a bunch on the freezer as well – thanks for the suggestion! Do I use the same directions and measurements to cook long grain white rice in my Instant Pot? Thank you Si! I have not made long grain rice in the Instant Pot. I recommend one cup water to one cup of rice and a tablespoon of vegetable or canola oil per three cups to prevent foaming. If your Instant Pot has a rice setting use it for cooking white rice! I need to make a lot of rice for a family party, do you think I could triple this recipe? or maybe even quadruple? The rule of thumb for Instant Pot when using a food that expands, (such as beans or rice), is never fill it past the halfway mark. So, depending on what size IP you own, you may be able to triple the recipe. The beauty of the IP is that the cooking time will be the same with one batch or three! Thank you for the information, I can’t wait to try it out! Could chicken stock replace the water in this recipe? yes I believe so. Same amount as the water. And I would omit the salt.